Dyne Technology looks at the problems of adhesion that medical device manufacturers may encounter. There is undoubtedly an incredible number of benefits that the use of plastics has brought to medical device manufacturers. Despite this, one problem remains for medical device manufacturing professionals –­ solving the problem of adhesion. 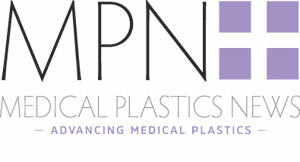 Many of the polymers used by medical device manufacturers such as polypropylene (PP), polyethylene (PE), cyclic olefin copolymer (COC), cyclic olefin polymer (COP) have low surface energies of between 29–36 dynes/cm² (mN/m). This low surface energy effectively renders these materials ‘non-stick’ and achieving good adhesion is difficult at best but often impossible. Examples of this include printing inks rubbing off and glued parts failing. These problems of adhesion lead to the products produced by medical device manufacturers failing product quality and safety tests. No matter how much engineers clean or abrade the surface of these ‘non-stick’ polymers, they remain difficult to coat, print or bond to without resorting to harsh, environmentally damaging chemicals or high temperature flame torch treatments. Medical device manufacturers are rapidly moving towards plasma being the surface activation method of choice and plasma technology is increasingly being used throughout medical device manufacturing processes. The reason? Plasma treatment improves the adhesion properties of these ‘non-stick’ plastics and offers a controlled and verifiable process where all variables are managed. The process is easily calibrated, providing a consistent and reliable method of surface treatment and offers quality assurance, a vital pre-requisite when approving a new medical device manufacturing process. Plasma surface activation is ideal for a number of applications and comes in a range of verifiable units to suit a multitude of manufacturing processes. From catheter tubing and cannulas to optical coatings and care products, Dyne Technology’s engineers have experience implementing plasma technology into medical device manufacturing processes over a range of applications. How does plasma treatment work? The strength of attraction between a material and a coating or adhesive is determined by the relative surface energy and surface tension of the materials. The higher the solid’s surface energy relative to the liquid’s surface tension the greater the molecular attraction, this draws the ink or adhesive closer for a higher bond strength. The lower the solid’s surface energy relative to the liquid’s surface tension, the weaker the attractive forces are which repels the coating or adhesive. Plasma treatment alters the molecular structure of a material’s surface to increase the surface energy of the material to the desired level. This increase in surface energy improves the chemical attraction to coatings, adhesives or printing inks, etc, leading to significantly improved surface wetting and adhesion strength. Dyne Technology engineers work in close partnership with medical plastics professionals exploring surface modification to measure the surface UK laboratory. By undertaking these tests, the appropriate treatment parameters are determined and ensure optimum treatment levels are achieved. To appreciate the plasma treatment process, we must understand the surface properties required to obtain the ideal conditions for adhesion. It is widely accepted that there are seven gatekeepers you must pass to improve your chances of achieving good adhesion; your surface should be clean, dry, dust free, smooth, non-porous, wettable and polar. Having a clean, dry, dust free and non-porous surface is straightforward, whereas creating a surface that is also wettable and polar is a more complex matter. Exposing ‘non-stick’ plastics to the highly active environment of a plasma is an effective and long-lasting method of increasing the material’s polarity, wettability and surface energy. Plasma is generally described as a super ionised gas, or an electrically neutral medium of positive and negative particles and neutrals which can react with a wide range of materials. The term ‘ionised’ refers to the presence of free electrons which are not bound to an atom or a molecule. Plasma is created when a gas – in the case of surface treatment often air –is subjected to a high-energy discharge; the gas then breaks into electrons, ions, highly reactive free radicals short wave UV light photons and other excited particles. Put simply, when you subject atoms or molecules to enough energy, what happens very quickly is that the electrons around the nucleus start to ‘boil off’. The free radicals and other particles that exist in the highly active plasma discharge can attach to the material's surface resulting in the formation of additional polar groups; these have a strong chemical attraction to paints, coatings, sealants, inks and adhesives leading to significantly enhanced surface energy, polarity and therefore adhesion. It is important to note that plasma treating doesn’t alter the bulk properties of the material and the molecular alterations occur only on the material’s surface. Although not widely discussed, not only does plasma provide an easily verified, controlled process to effectively change the functionality of plastics, composites and rubbers; it also offers a green, solvent-free method of removing organic contaminants from the surfaces of metals, ceramics, plastics and more. The plasma cleaning process is both clean and dry, cleanroom compatible and all equipment is easily calibrated to provide a consistent, verifiable and easily reproducible method of surface cleaning. The cleaning process occurs when plasma is created; as the gas (often air) that is used to create the plasma breaks up into a highly-charged mixture of particles, the excited species effectively scrub the surface clean. Brandon Medical contacted Dyne Technology when looking for a solution to its adhesion problems. The companies worked closely together to analyse the problem and find an efficient and cost-effective solution. Following a series of tests, it became clear that the surface needed to be both cleaned and activated to allow the coating to fully wet the surface and achieve the high level of adhesion required. These test results combined with a detailed understanding of Brandon Medical’s manufacturing process led to the choice of the PlasmaTEC atmospheric plasma treatment unit as the solution. Atmospheric plasma devices can sometimes be referred to as air plasma, plasma jet or a plasma nozzle. The zone in front of a plasma nozzle is highly active and an excellent method of increasing the surface energy of plastics. Atmospheric plasma solutions are easily integrated with automation – an important pre-requisite for Brandon Medical. Employing a 3-axis bench top robot equipped with a PlasmaTEC atmospheric plasma treatment unit gave Brandon Medical the process control and flexibility required. The 3-axis bench top robot ensures accurate positioning of the atmospheric plasma treatment nozzle throughout the entire surface treatment cycle, guaranteeing a consistent plasma application. The cell is designed to allow the future integration of additional process equipment, giving the unit flexibility for any changes to Brandon Medical’s future manufacturing process. Dyne Technology supplied a leading medical device manufacturer with the VacuTEC 2020 vacuum plasma unit. The customer faced adhesion problems involving an implantable polypropylene medical device. The ‘non-stick’ nature of the polypropylene made achieving adhesion impossible and the customer required a repeatable and reliable method of surface activation. Following in-depth discussions and collaborative testing with Dyne Technology engineers, the high technology VacuTEC 2020 Vacuum Plasma unit was selected as the surface activation method of choice. Using a vacuum pump most of the air is removed from a sealed chamber. When the pressure in the plasma chamber reaches the required level the remaining air (or other gas) in the chamber is subjected to a strong electrical field, creating a Plasma. This is used to modify the surface of the component. The unit has given the customer the ability to take charge of the plasma treating process allowing its engineers to have control over quality assurance.